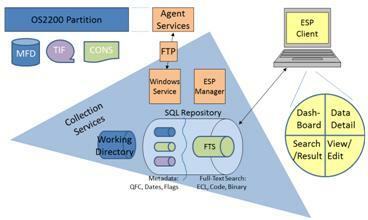 ESP-Dorado components include agents operating under OS 2200, Collector Services on a Windows Server maintaining a SQL Server Repository, and a Windows-based Client Program. The agent operates as an OS 2200 disk and tape activity monitor. Each OS 2200 partition hosts its own uniquely identified agent. Disk/tape activity is captured and forwarded to the Repository Server for near-time maintenance processing. The main job of the Collector Service is to harvest and maintain a record of 2200 host assets. Joint processing with the 2200 Agent provides an organized version of the original OS 2200 information. Additional services provide administrative controls and Client access rights as funneled through to the native OS 2200 security system.